If you’ve ever had a chimney leak, you likely know how essential a good chimney crown is. This important component, which rests at the top of the chimney stack and seals the masonry chimney off, plays a key role in keeping moisture and debris out of the chimney system. 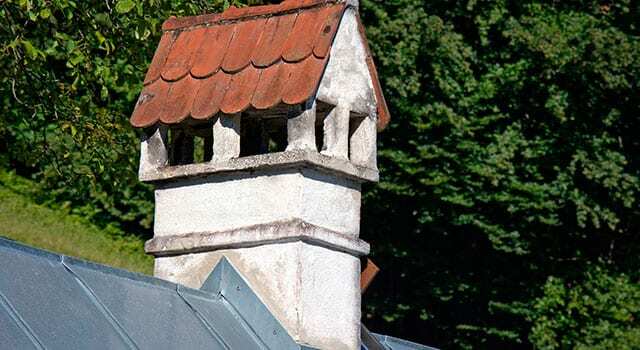 When designed and installed by an experienced professional, the chimney crown will have a slight slope to direct water, snow, and sleet off of the crown and onto the roof. But it’s not just a proper slope that determines the effectiveness of the crown – it’s the thickness and edge as well! In order to stand up to the constant abuse of the elements, a proper crown should be at least 3 inches thick at its thinnest point. Proper thickness helps ensure that the crown won’t deteriorate prematurely. Additionally, the crown’s drip edge should extend at least a couple of inches past the chimney stack so that all the moisture running off of the crown doesn’t go right down onto the masonry of the chimney or the surrounding flashing. Are All Chimney Crowns Created Equal? Unfortunately, it’s not uncommon to find crowns that are too thin, too flat or that end at the chimney stack. Many of these crowns are also built of standard chimney mortar, as opposed to cement with mesh reinforcements. And in many cases, poor construction is to blame for crown failure and premature deterioration. Cracks may form along the crown and water may make its way into the home through these cracks. Additionally, flashing may rust and chimney masonry may deteriorate as a result of water dumping down onto these areas. Whether poor construction is to blame for your crown issues or time and weather have simply worn your crown down, you can count on Jiminy Chimney to make the necessary repairs. We specialize in crown repair and use quality products to seal any cracks or crumbling areas on the crown. The crown repair products we use work wonders and can prevent cracks in your crown from growing. When professionally applied, these products provide an even, sealed surface, making old, weathered crowns effective and beautiful once more. If your crown could use a little repair, or even if you need to have your crown completely replaced, you can count on Jiminy Chimney. We’ll get the job done fast and leave you with a beautiful, effective crown that will do its job, year after year. To request an appointment to have your crown inspected and repaired, please call us at 847-893-0063. Our Chimney Safety Institute of America (CSIA)-certified professionals are here to help! wherever you live in the greater Chicago area! Prefer to request an appointment online? Fill out our online appointment request form! Is your chimney leaning? Missing bricks or mortar? Jiminy Chimney can repair or rebuild chimneys to restore their safe function, looks, and structural integrity. Call on our experts for the chimney and fireplace services you need.